Use this Telly Award Winner with your team to generate richer discussions about what matters most. And it will help viewers better handle everyday challenges in life and at work. We live in a non-stop, complicated and challenging world. 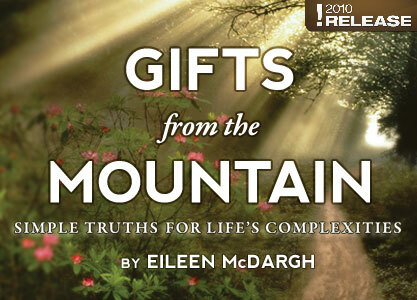 In Gifts from the Mountain, Eileen McDargh emphasizes how slowing down and noticing our surroundings can make an enormous impact on our daily lives. She discusses how her backpacking trips around the world forced her to slow down, consider her surroundings, and get away from the demands of an otherwise hectic life. The lessons she learned helped her become more productive and positive at home and in the workplace. This beautiful and insightful film discusses some fundamental truths to help us deal with life’s complexities by enjoying the journey. We all climb some kind of mountain every day. By considering what we are doing and how we are doing it, we can have a better appreciation for what is going on around us, stronger tools to deal with challenges and complications, and overall, a more meaningful, purposeful life.